Resurface Solutions ::: Isopropyl Alcohol 5 Gal. Solvents → Isopropyl Alcohol 5 Gal. Isopropyl Alcohol is an excellent degreaser. 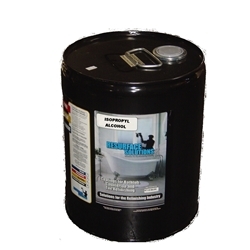 This strong cleaning agent removes dirt, oxides, oils, smoke film, and corrosion from both metal and plastic parts. It evaporates fast and leaves no residue. Resurface Solutions Isopropyl alcohol is 99.9% pure, unlike common rubbing alcohol, which can contain up to 25% water. Plastic safe.